Examples of a continuity offense include: the Flex, the Swing, and the Chin Set. There are many different continuity offenses. A continuity offense is one where 5 players are interchangeable and execute the same basic action over and over with the goal of forcing the defense into a mistake. These types of offenses look to generate a good shot for each of the 5 positions and focus on teamwork and passing to set up scoring opportunities. The Chin Set is easy to install because it is similar to so many other continuities like the Flex or the Swing. In fact, those continuities have 5 player motion whereas the Chin Set only uses 4 players that have to learn all of the perimeter cuts and reads. (When I say “5 player motion”, I mean that all 5 offensive players have to memorize what to do at each position within the continuity.) Here, only 4 players have to learn the cuts and reads. The post player, while always a threat, will initially set many different screens at different angles for the cutter to score. It is simpler to learn because you only have to teach 4 players the cuts off the screens the the 5th player is a screener. The trend in the NBA that has filtered down, somewhat, through the rest of the levels is the movement towards PPP (points per possession). The Dribble Drive Motion Offense states as a goal that shot selection is only “3 or key” meaning they want three point shots which are worth more per possession, even misses, than two point shots. 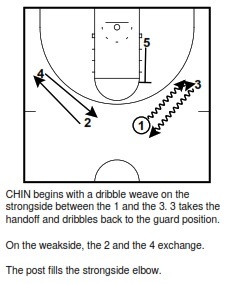 The Chin Set creates layups with the player moving to the rim for the catch and finish. The set accomplishes this because of excellent spacing in a high 2-3 set. One of the weaknesses of the Flex offense is the cut and catch across the lane because the offense has to relocate and score without knowing where the defense is located. On the other hand, while cutting off the backscreen, the cutter knows the defender is trailing because the passer reads the defense to make the pass for the layup. 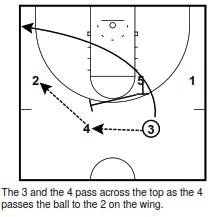 Secondarily, if a layup is not available, the set focuses on downhill drives from the top of the key off of a flare screen read. Flare screens will only become more and more important as teams begin to shift their defensive focus towards a “Packline” type of defense instead of the traditional force baseline style. These types of screens create a driving lane for the offense to attack downhill and also force the defense to move if not shot is available. For these reasons, the Chin Set is effective because it creates the two most valuable shot attempts in the game: three point shots and layups. The Chin Set offers a ton of variations that a coach can call out and for players to make reads. Over time, a coach will be able to read and adjust the set accordingly to continue to create good shots on offense. Also, there are many common actions and counters that a coach will want to add to keep the defense off balance. One of negatives of most continuities is the predictability and every coach needs to have adjustments ready as the defense adjusts. 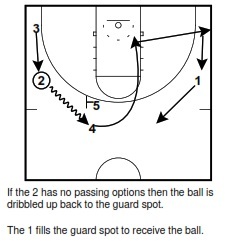 This set allows a coach to quickly isolate matchups whether it be in the post or on the wing and to create shots based on how the defense is playing. 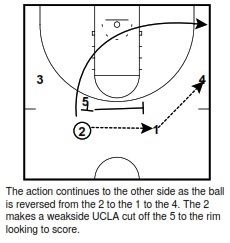 One common rule is that when a team pressures passes the set should look for a backdoor or wing drive and when a team sags off and almost zones then we should look to screen in the defense for the 3 point shot. There are many reads that you can teach in a breakdown drill and counters that a coach can add as the season progresses to keep options open for your players and to create layups and three point shots out of the Chin Set.